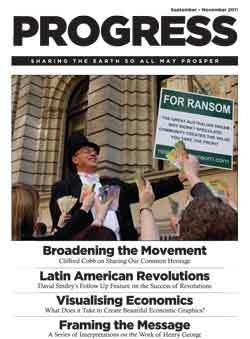 This edition of Progress carries the theme “Framing the message of Henry George in the 21st century”. Thank you to everyone who contributed articles, I’m pleased with the quality and diversity of the work received. You will find a broad and intelligent analysis of many issues facing contemporary Georgists as we carry the flame forward together. There are plenty of other articles outside the theme, including another fascinating ‘Geoists in History’ featuring the education reformer John Dewey. There may be some articles you’re not used to seeing in Progress, including an interview with Katherine Mulbrandon from the website ‘Visualising Economics’. I find her graphic illustrations of economic issues very informative and I encourage readers of Progress to consider creating their own graphics on Georgist themes. There are some very innovative ways to communicate our message and we need to make better use of them. I hope you find some creative inspiration from her work. An essay by Clifford Cobb entitled ‘Broadening the Movement’ ties in nicely with the ‘framing’ theme. It’s not a traditional Georgist essay, but you should find it thought provoking so please read it through. Mr Cobb’s essay was written in honour of Alfred Andersen and his work on ‘common heritage rights’. I was grateful to receive Anne Schmid’s essay on ‘Christianity and Henry George’ because George’s work was framed entirely within the Christian message. His popularity peaked at a time when that frame was far more overarching of the population than it is today. There are three other articles within the ‘framing’ theme. Gavin Putland’s ‘Egalitarian’ essay, Karl Williams on ‘Geoism and the environment’ and David Brook’s article from the ‘tax is theft’ point of view. An exciting development of late has been the renewed ‘mainstream’ interest in our ideas. Ken Henry’s tax review, think tanks like the Grattan Institute and consultants to government like Access Economics have all produced reports that clearly spell out the benefits of replacing inefficient taxes with public revenue from land and resource rents. I believe we are very close to achieving significant gains for our cause and it is up to us to continue making inroads into the mainstream arena. What a phenomenal launch for the documentary ‘Real Estate 4 Ransom’! Congratulations Karl Fitzgerald and Gavin Emmanuel, your tireless hard work has really paid off. Let’s hope the ABC or SBS pick it up! David Collyer has also been busy with features on Today Tonight – keep an eye out for pics in the following pages. Progress now contains more pages than previous editions. This has been possible by switching from bi-monthly to quarterly distribution, which allows a wider selection of articles to be published. I look forward to reviewing your contributions for the next edition. Publication dates and submission deadlines will be available for 2012 on the Prosper website shortly. Openness, inspiration, innovation, creativity and motivation will lead us toward an economically efficient and socially just society. It is these attributes I hope you find in the following pages.